OK, Maybe using CRM for Fun is an overstatement, but it can be used by astute sales reps to make quota, if they use the tool to their advantage. 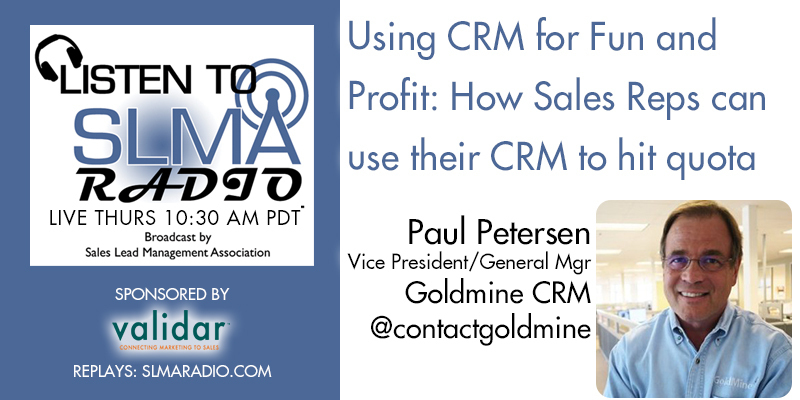 Listen to GoldMine's Paul Petersen discuss CRM and the Three Builds concept. Listen on iTunes while using stair climber! Paul Petersen is the general manager and vice president of the GoldMine. His career spans working with sales & marketing systems and process having developed, managed, and sold for companies including McDonald's Corp, General Electric, Symantec, Allied Van Lines and now has 16 years with CRM background at GoldMine.